In this issue: We get the sweet and tart sides of cranberry growing and see photos of ourselves through the lens of an anti-portraiture photographer. 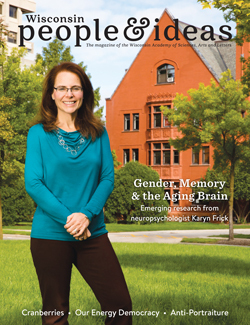 A report from our Climate & Energy Initiative director Chelsea Chandler untangles the knot of how decisions are made surrounding electricity generation and transmission, and an article on UWM neuropsychologist Karyn Frick explores emerging research about the role estrogen plays in making and keeping our memories. We preview and upcoming Watrous Gallery show by Milwaukee artists Maggie Sasso and Nathaniel Stern, and share the 2nd place winning story from our 2018 contest. New Wisconsin poetry, book reviews, and a few happenings around the state round out our Fall 2018 issue. Everything you wanted to know and more about Wisconsin's state fruit: Vaccinium macrocarpon, better known as the large-fruited cranberry.